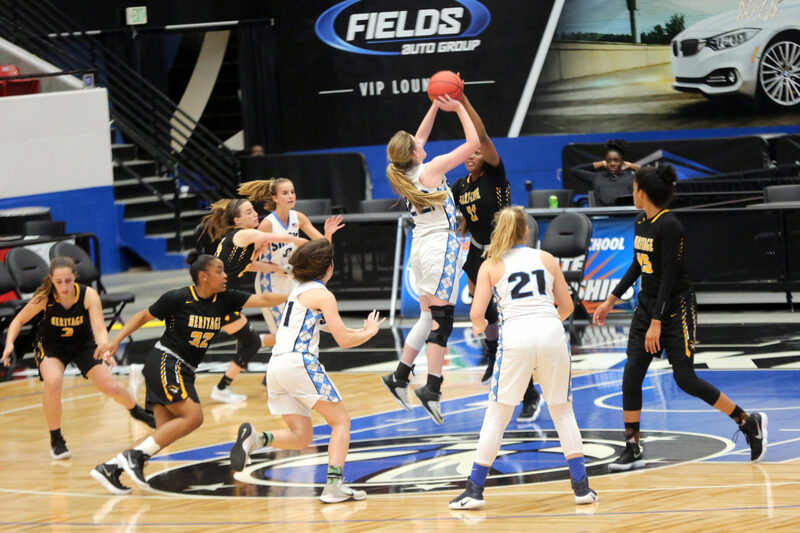 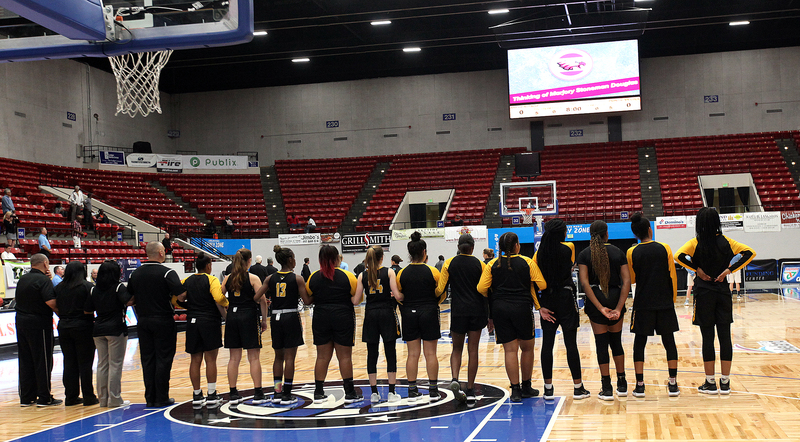 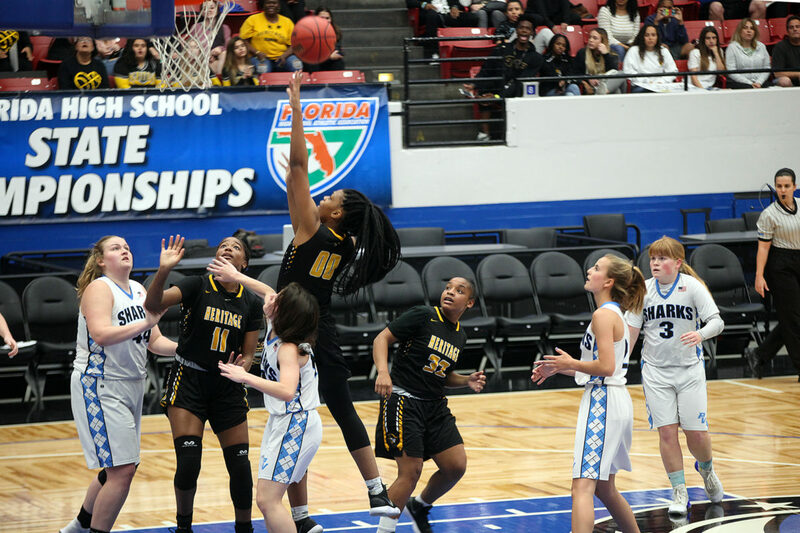 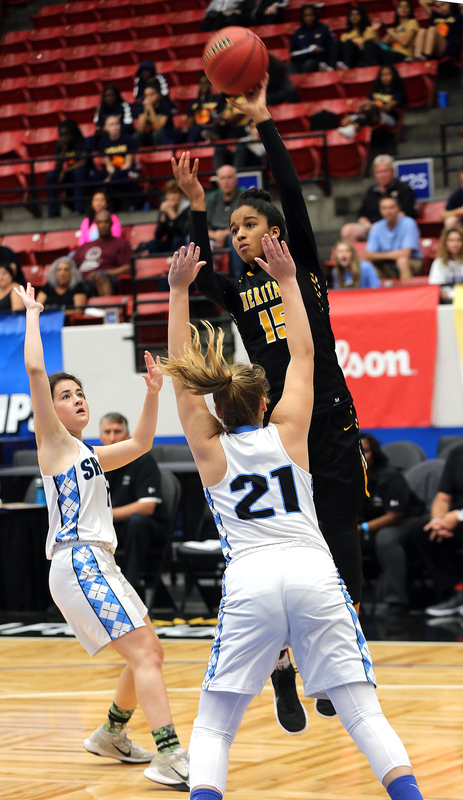 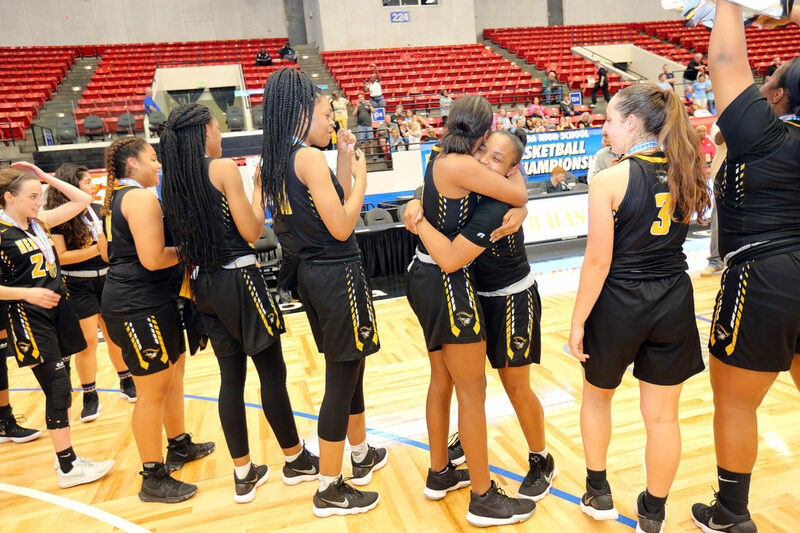 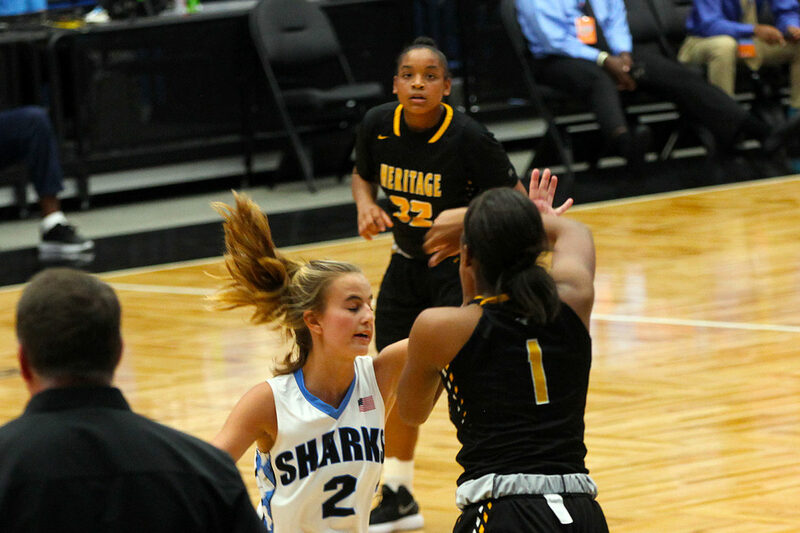 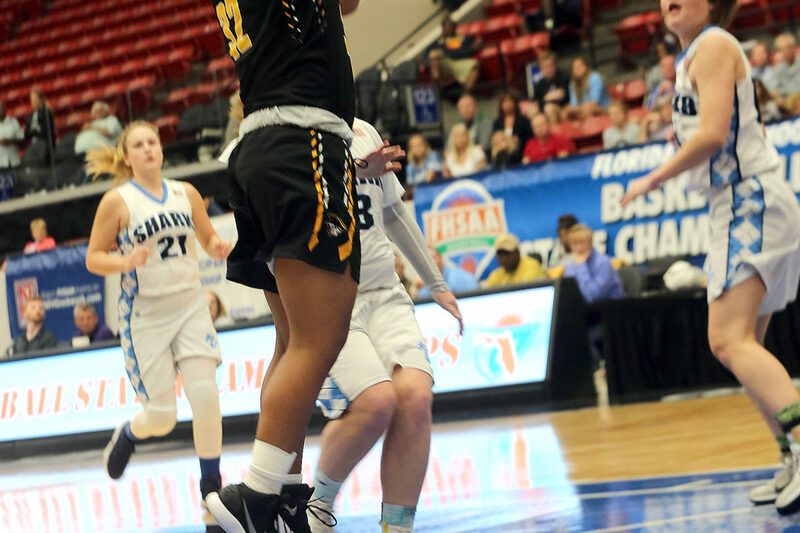 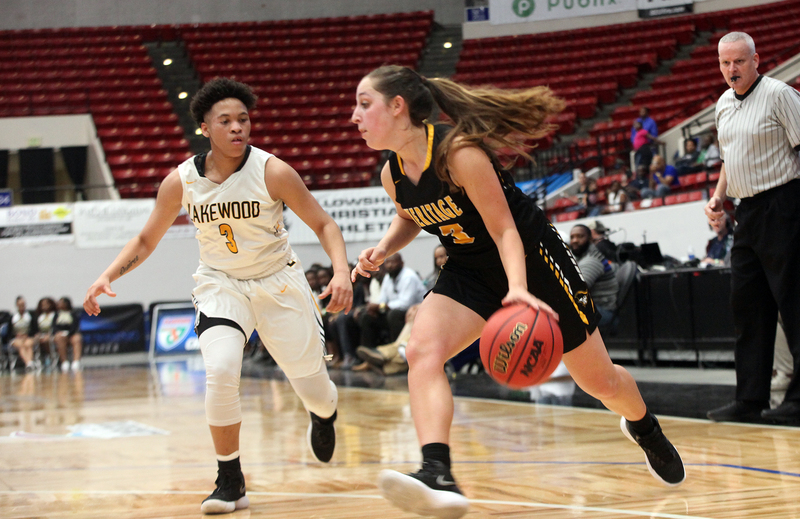 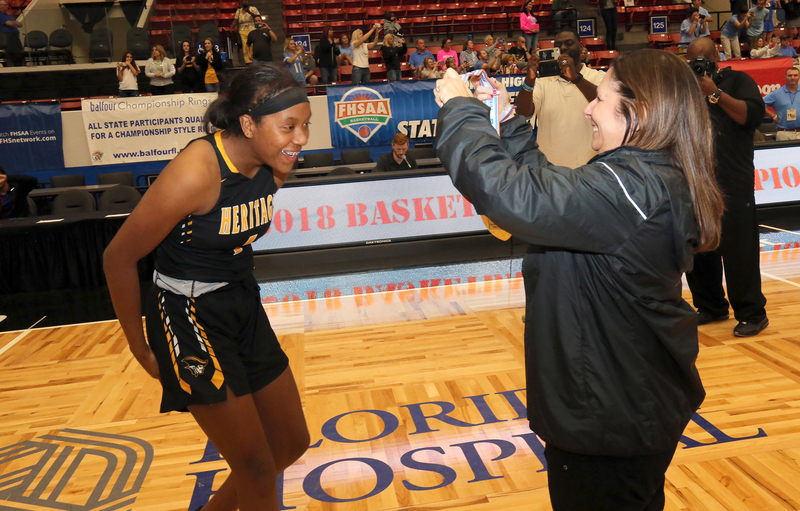 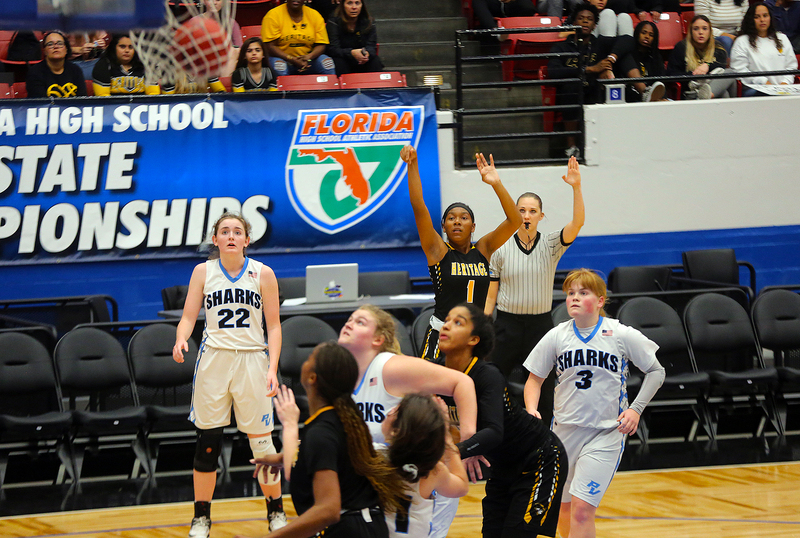 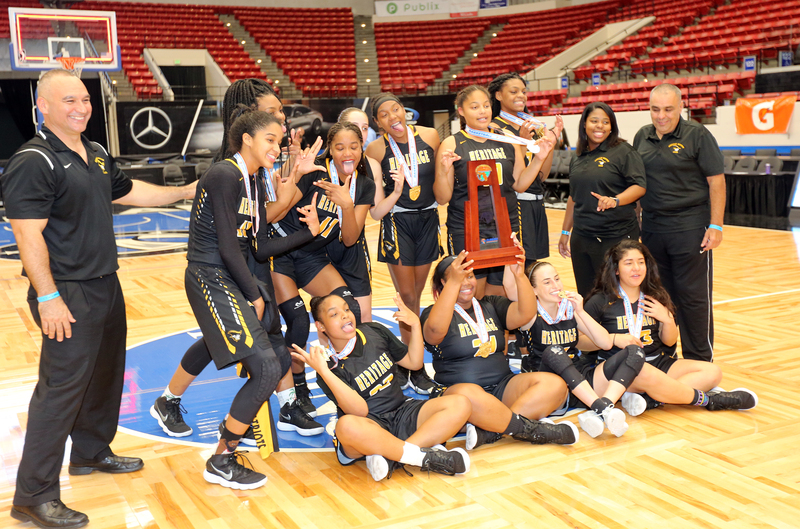 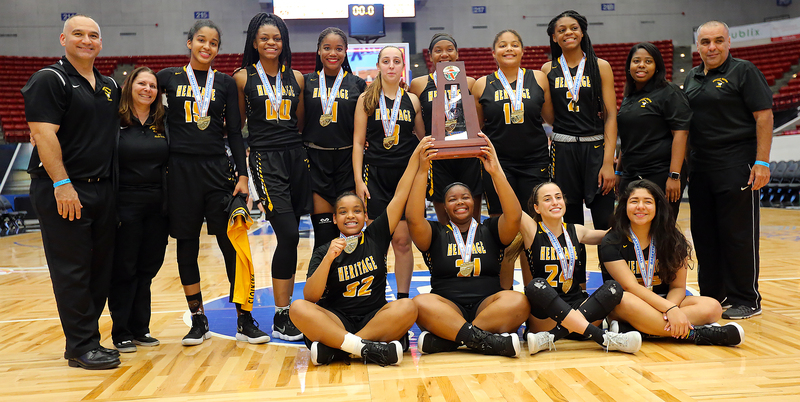 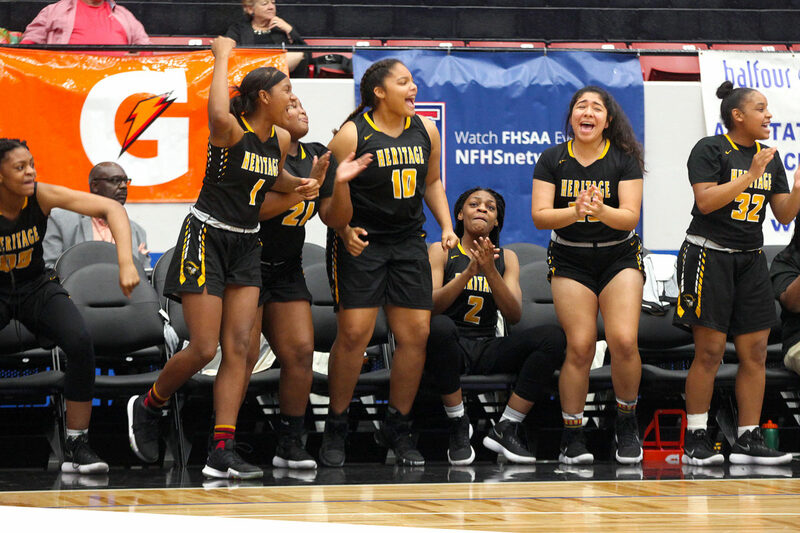 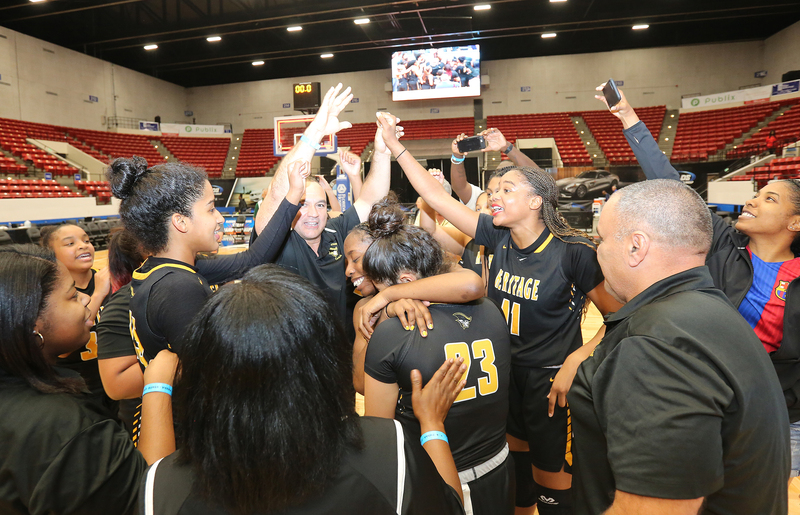 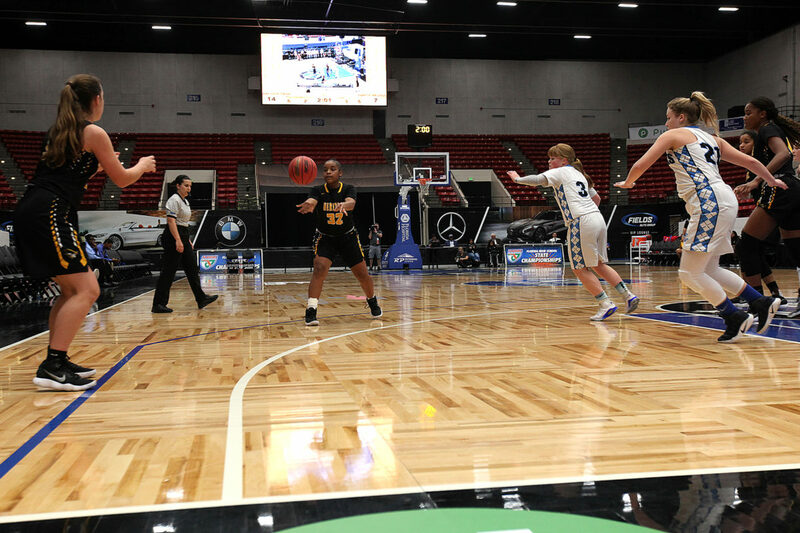 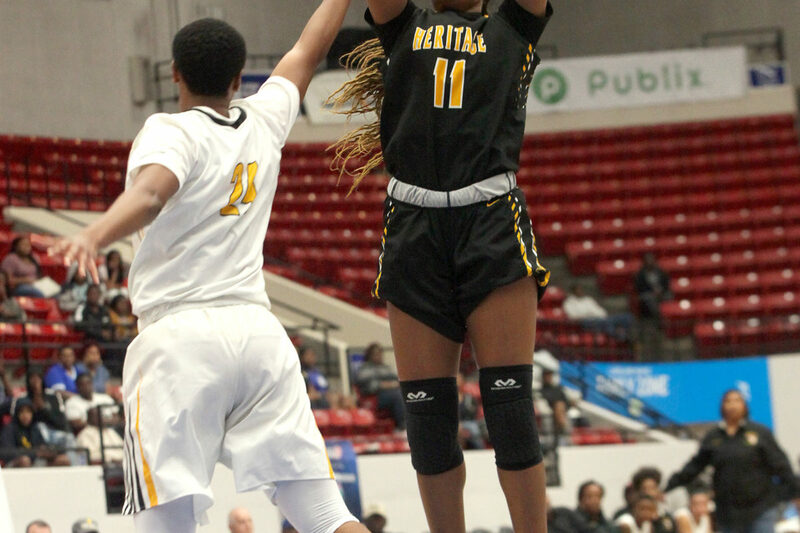 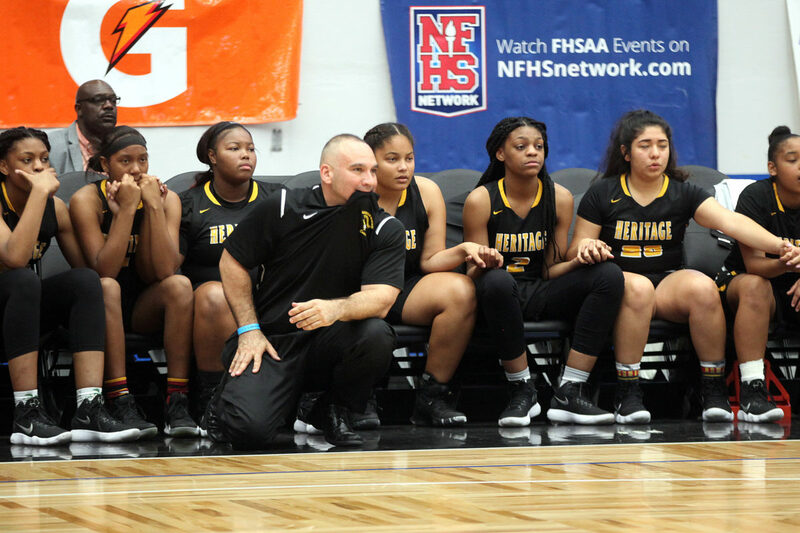 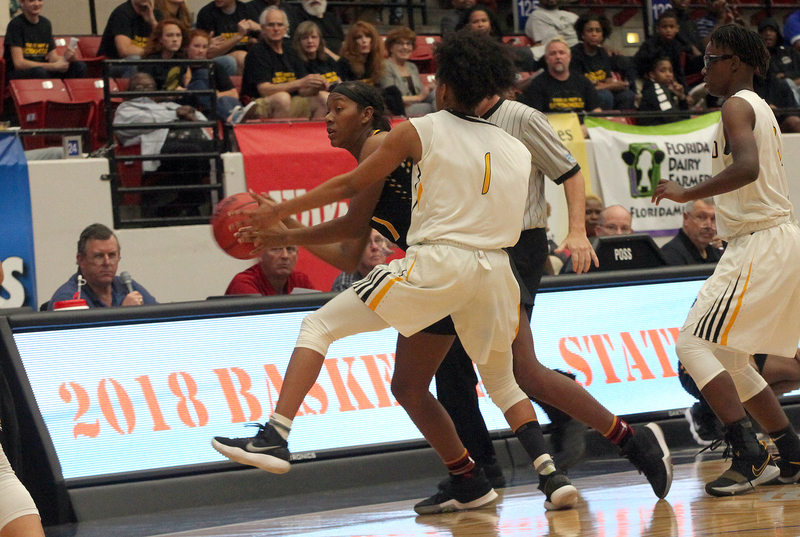 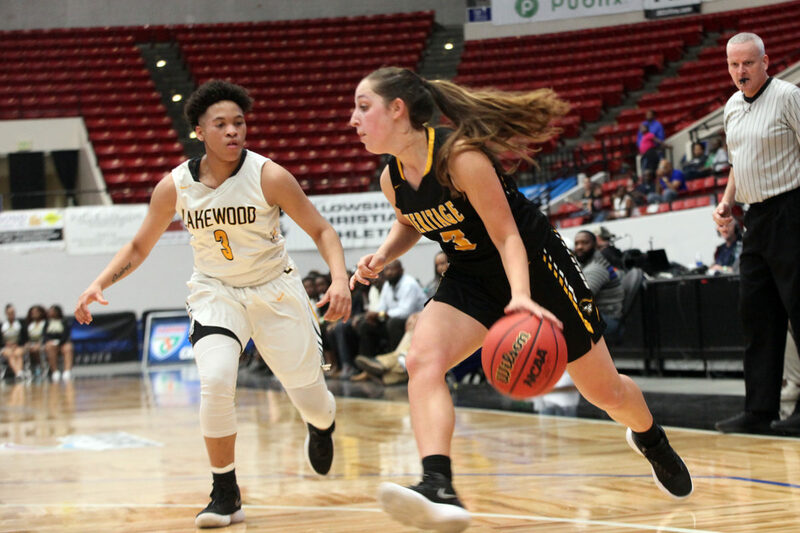 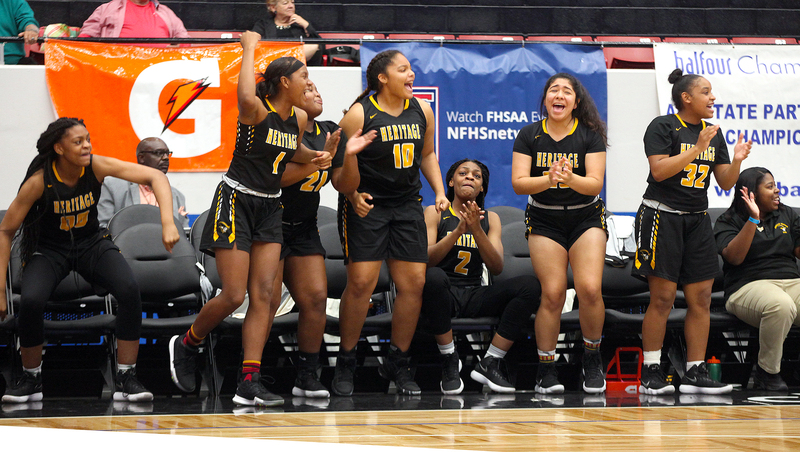 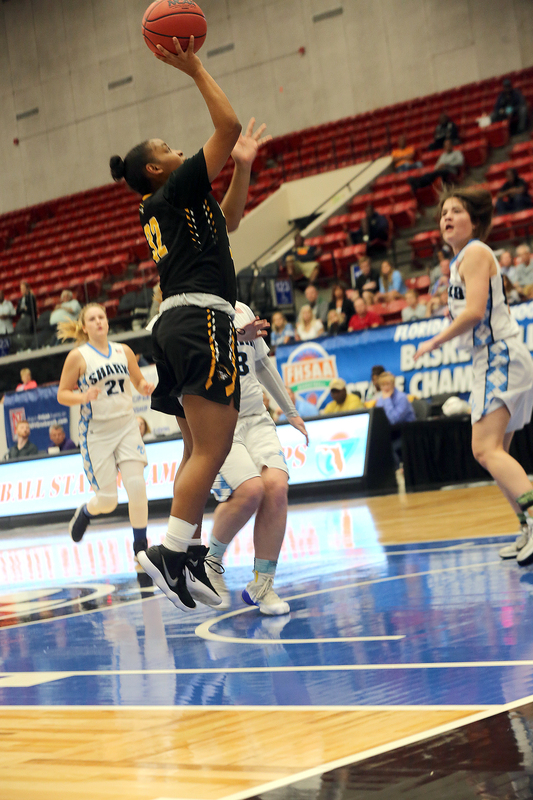 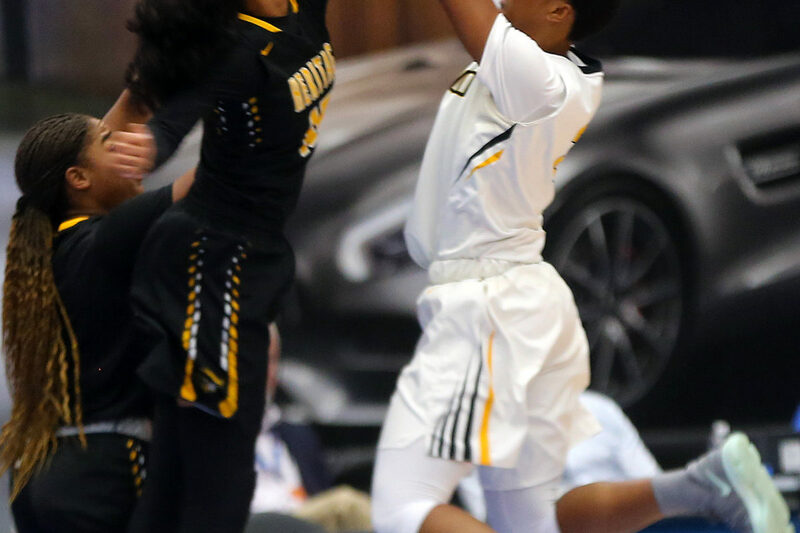 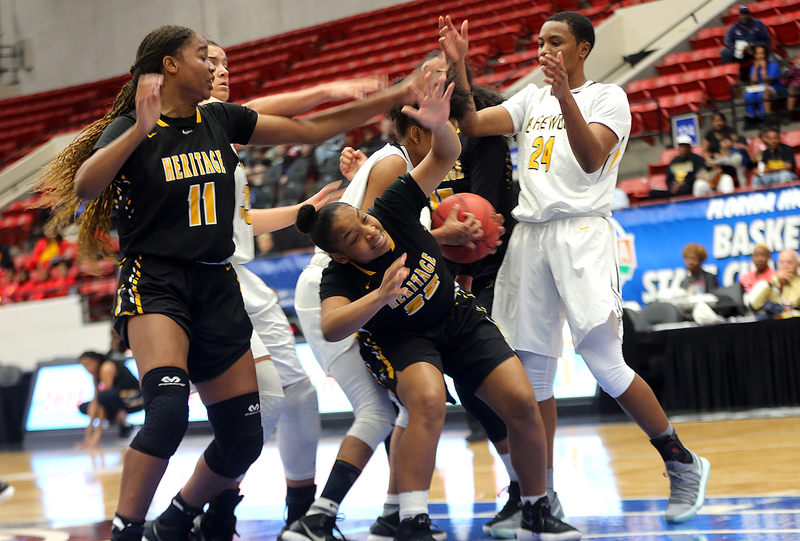 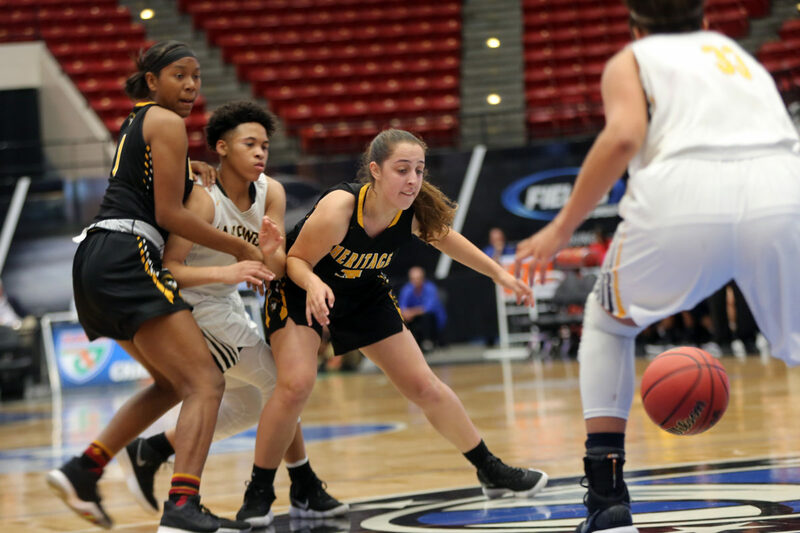 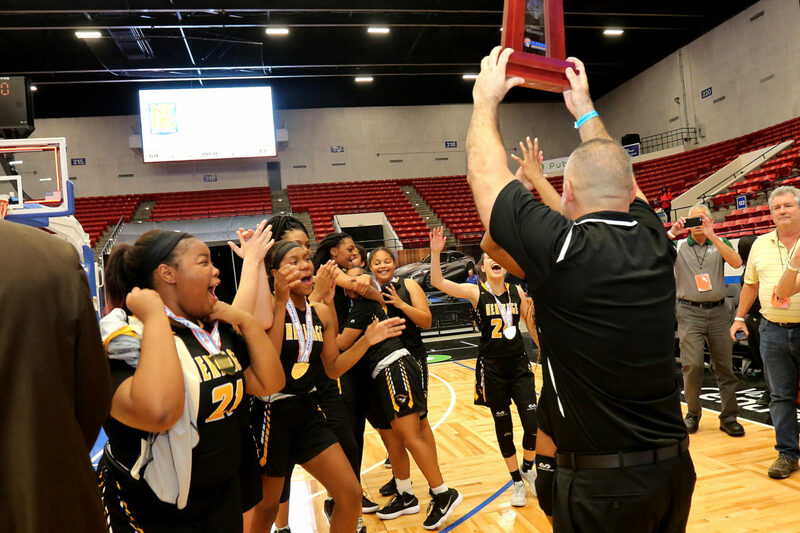 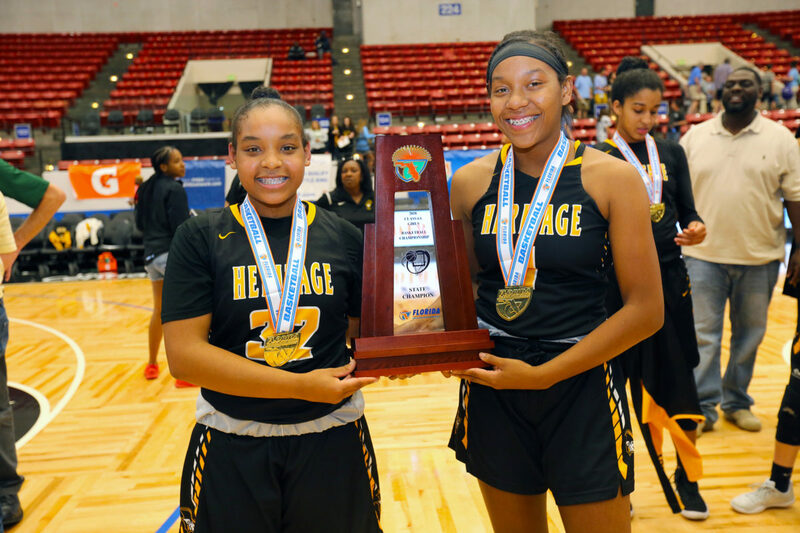 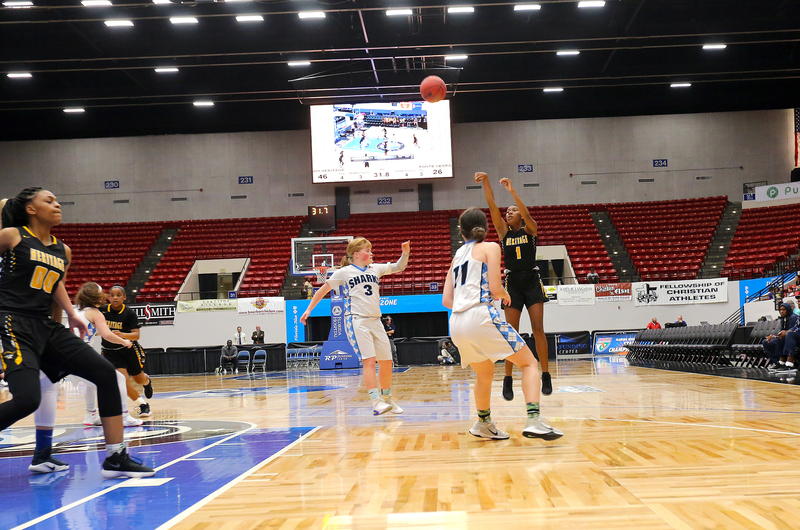 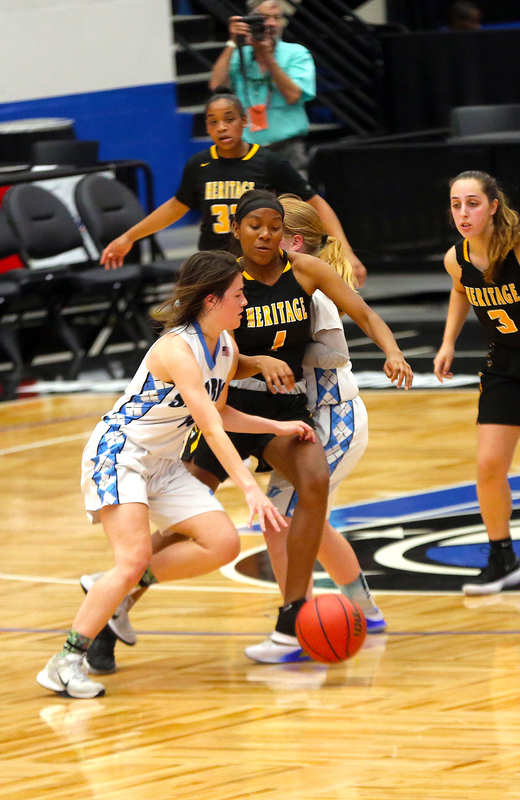 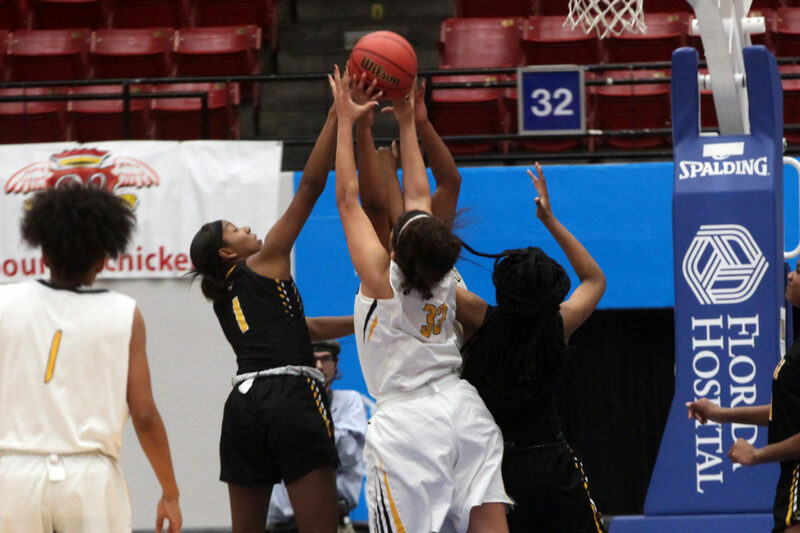 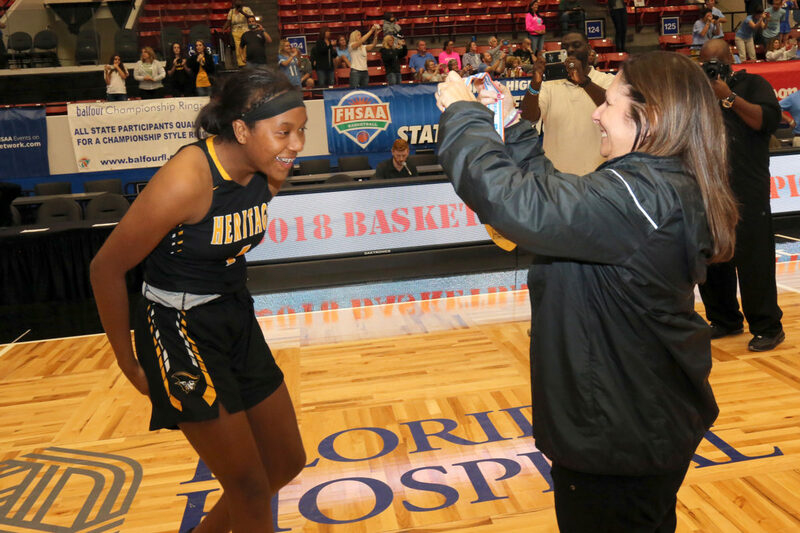 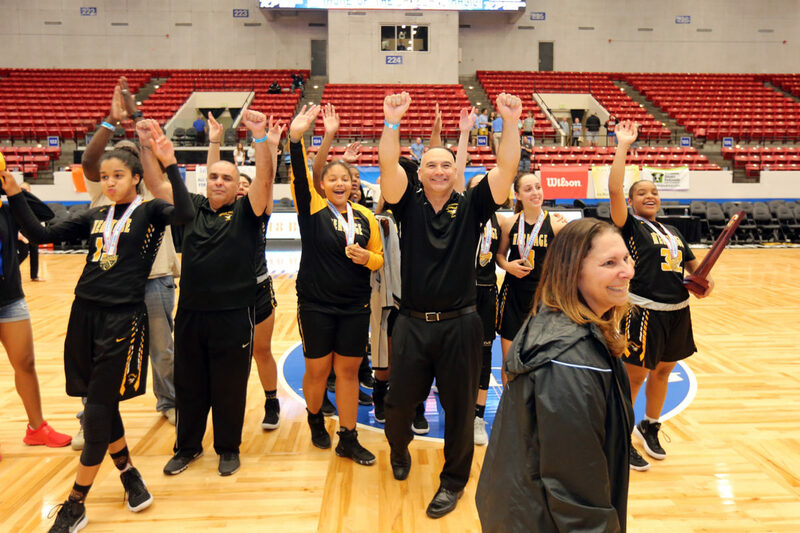 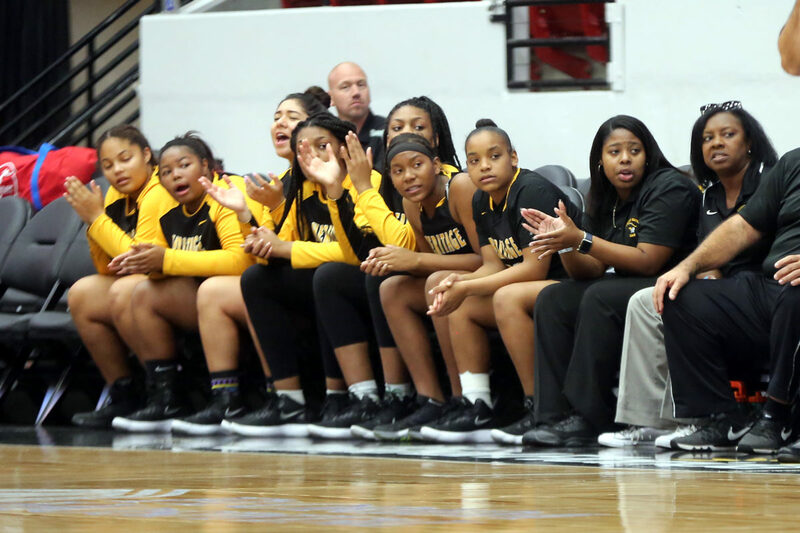 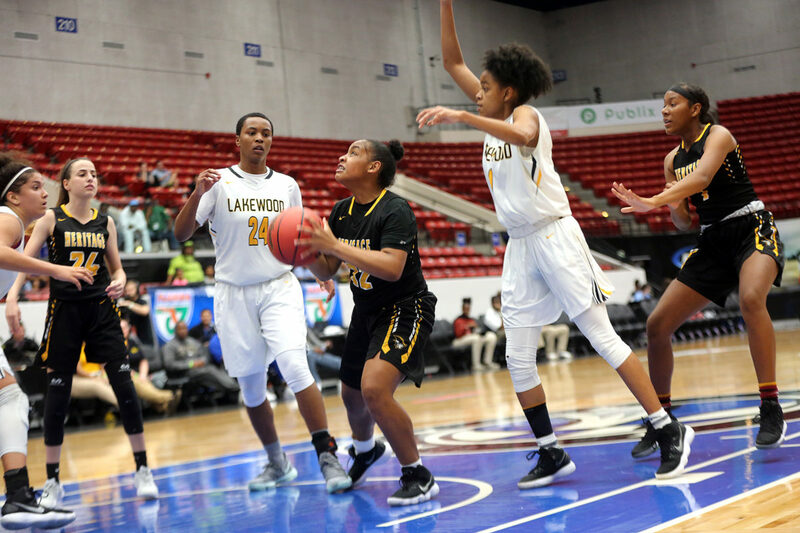 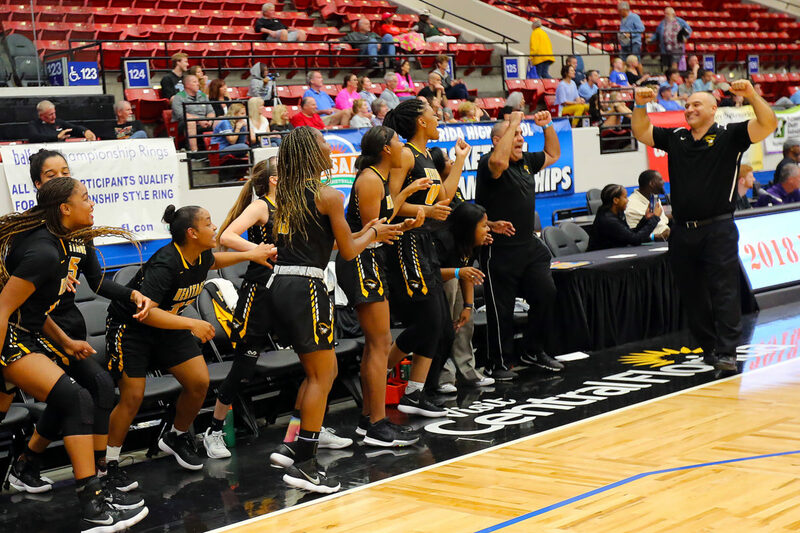 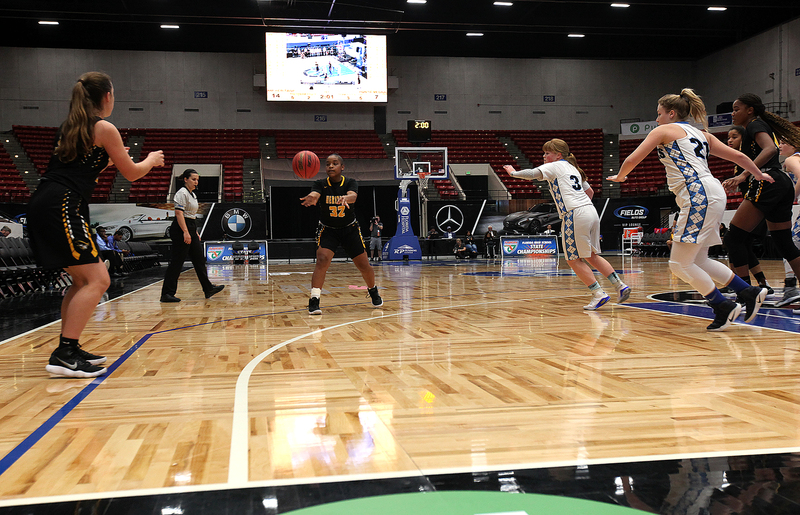 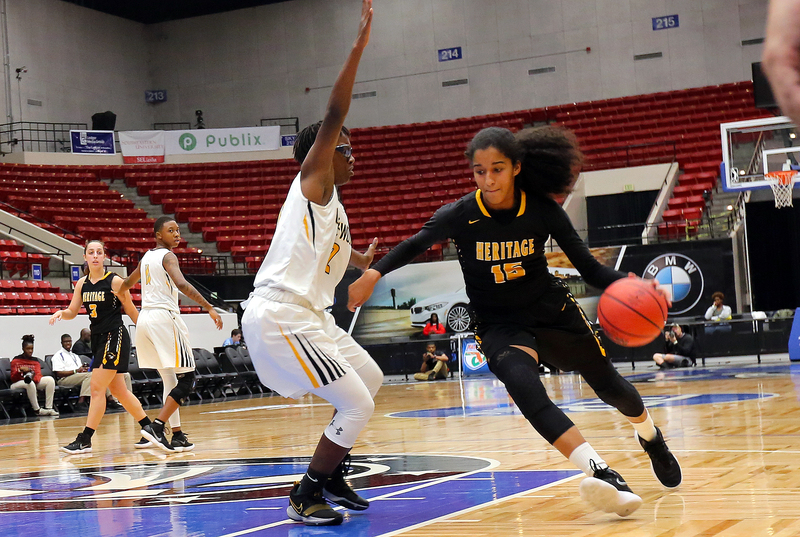 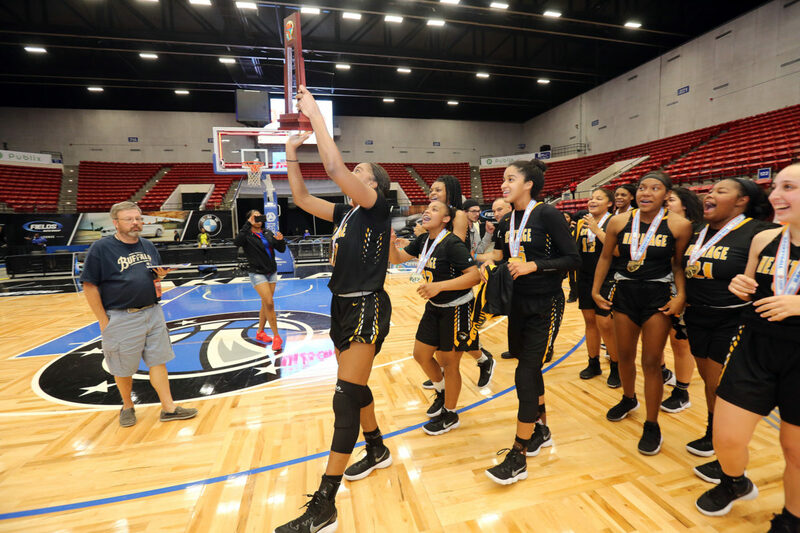 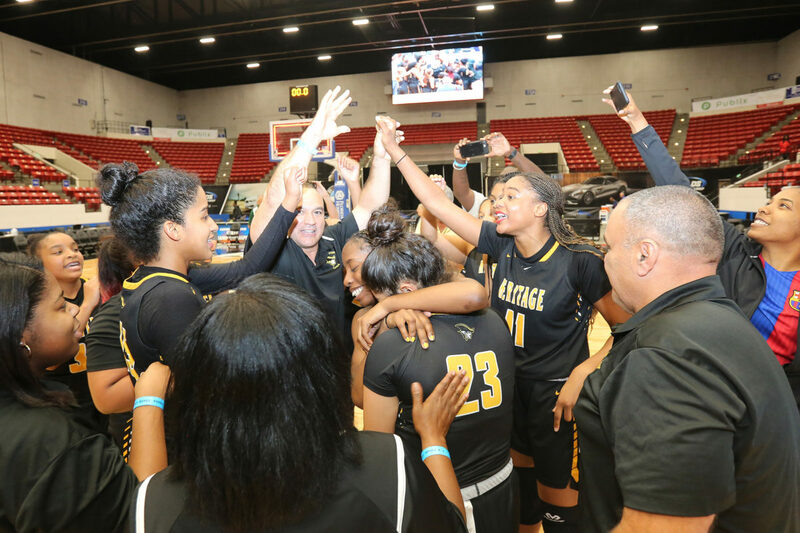 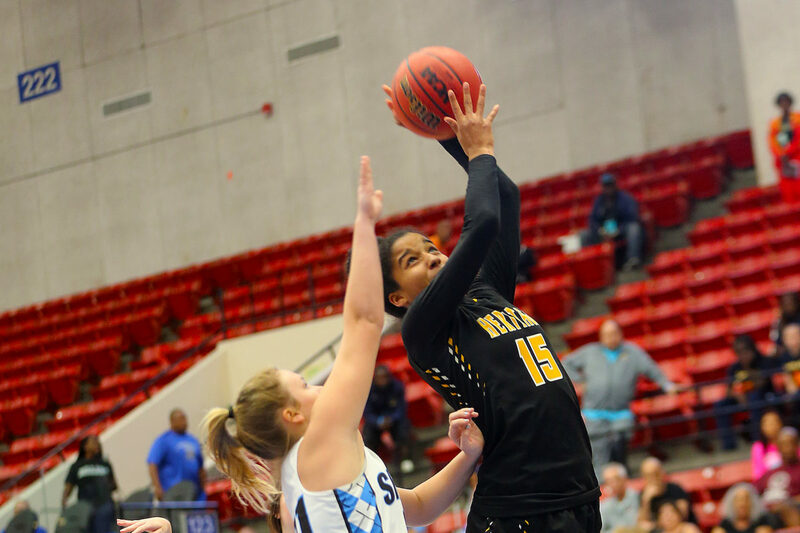 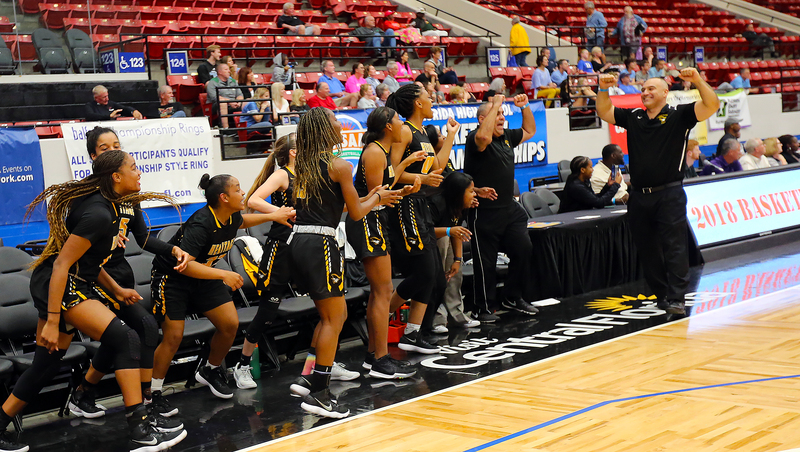 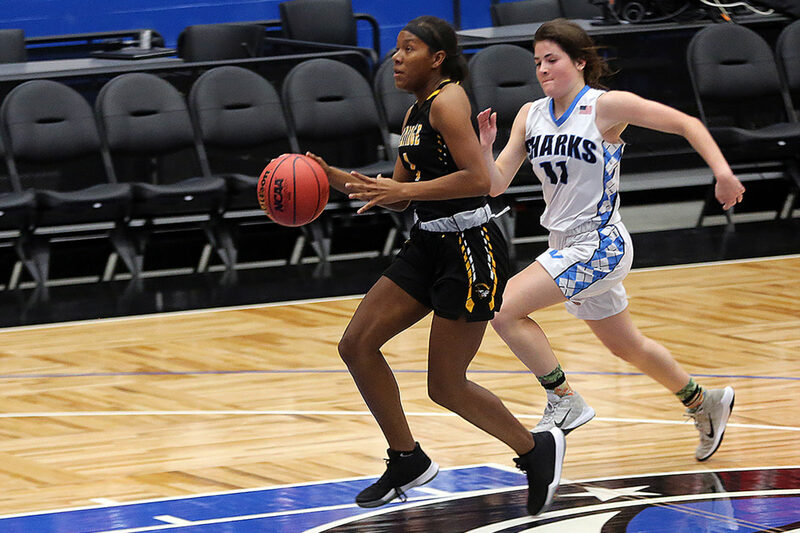 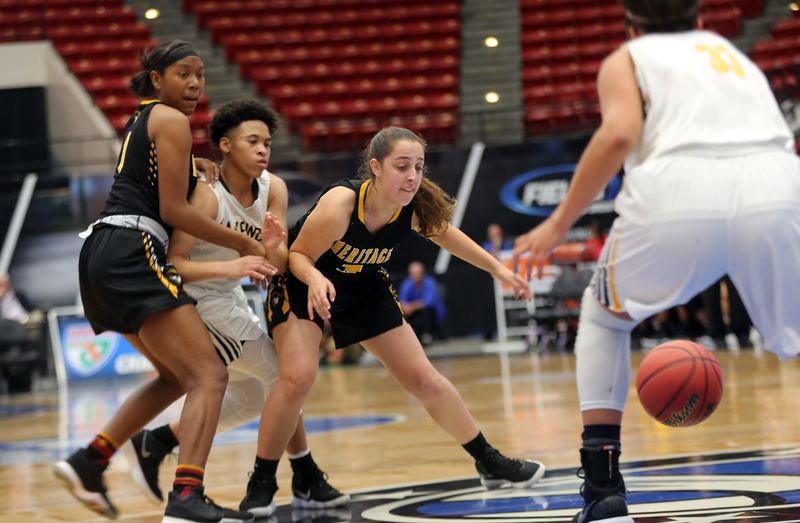 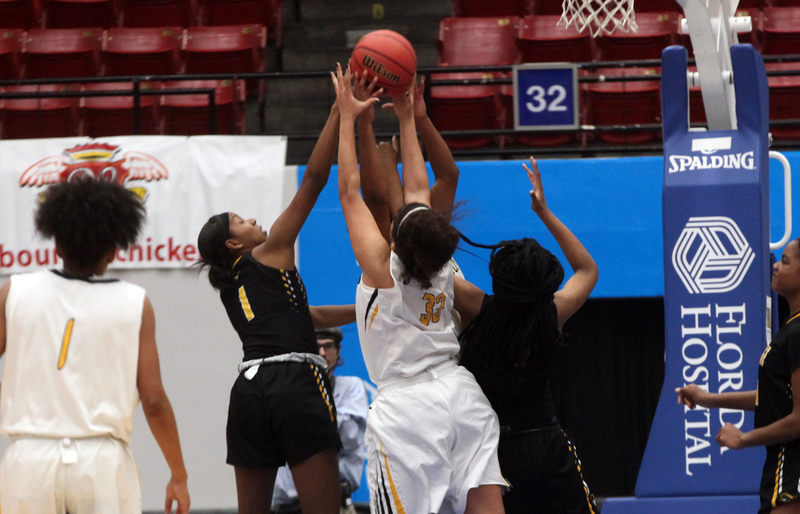 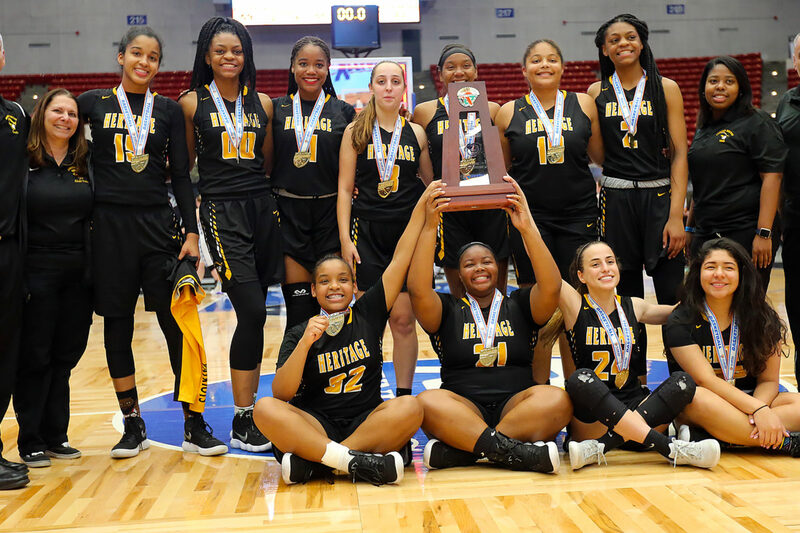 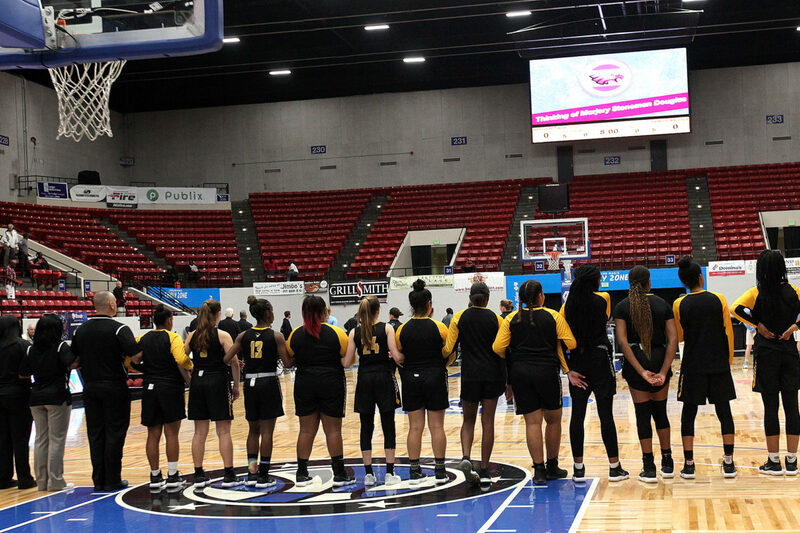 LAKELAND — Tiana Stubbs and December Stubbs, of the Hollywood Reservation, combined for 16 points as American Heritage captured its first girls basketball state championship March 1. The Patriots, who flexed their advantage in size, speed and strength at both ends, proudly clutched the Class 6A trophy amid a celebration at midcourt after their convincing 59-33 win against Ponte Vedra at the RP Funding Center in Lakeland. 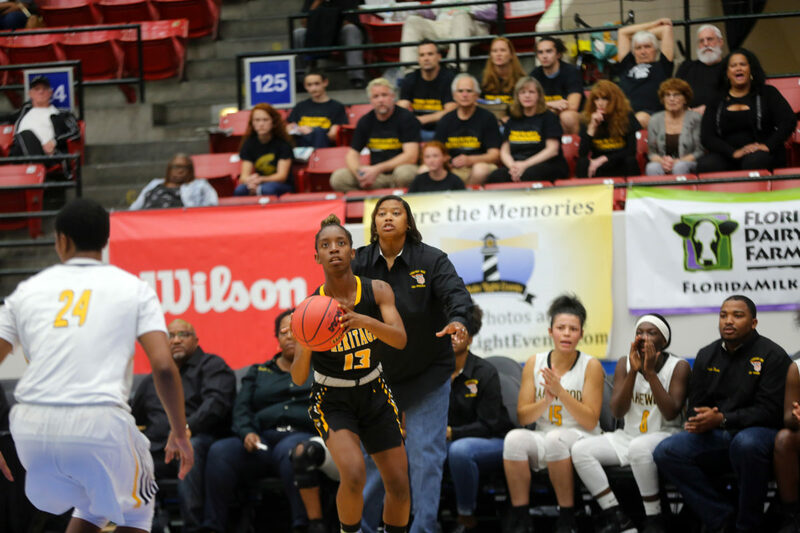 “We made history,” said December, who dished out a game-high four assists to go along with seven points. 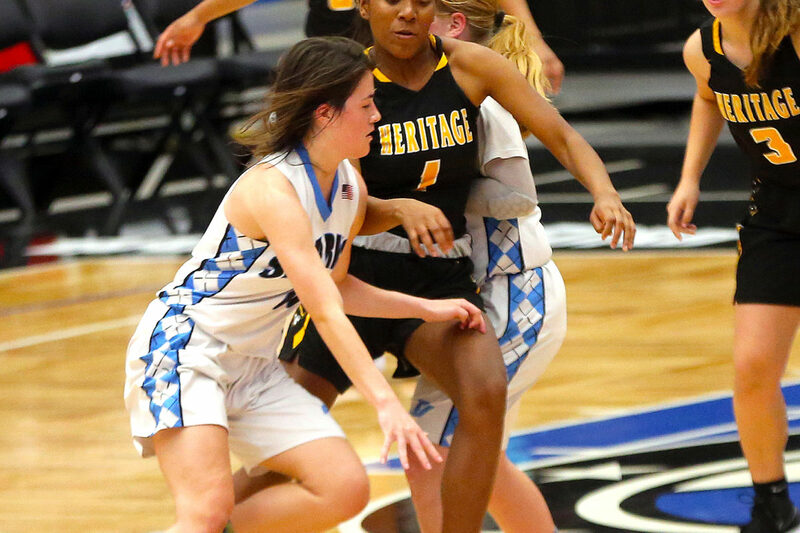 Heritage finished with a 23-7 record. 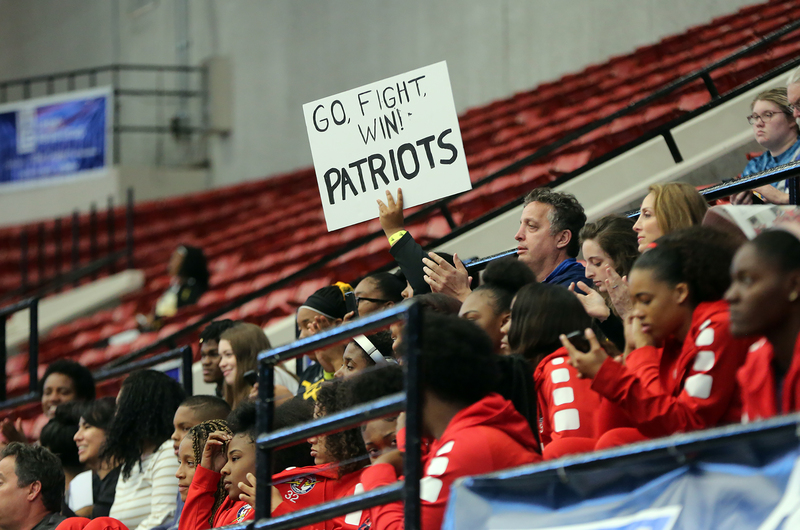 Unlike a year ago when the Patriots were ousted in the state semifinals, this season ended in triumph. 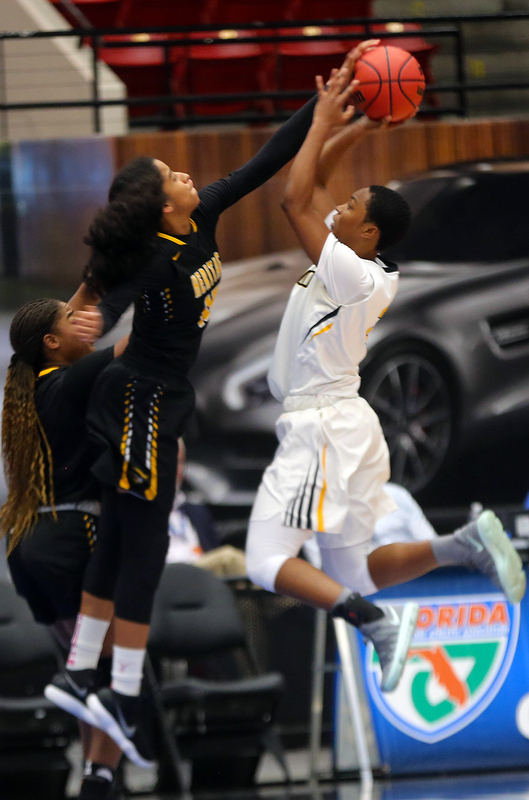 The Stubbs sisters came off the bench and made immediate impacts in the first half. December, a point guard, scored her first points on an uncontested layup which gave Heritage a 14-7 lead late in the first quarter. 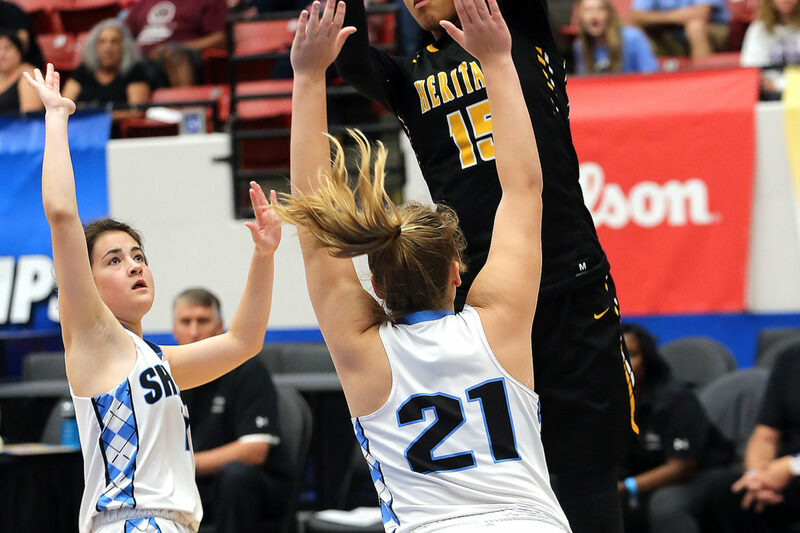 Even though she is one of the team’s shortest players at 5-foot-6, December doesn’t mind getting in the middle of the wars in the paint, often battling bigger opponents for rebounds. 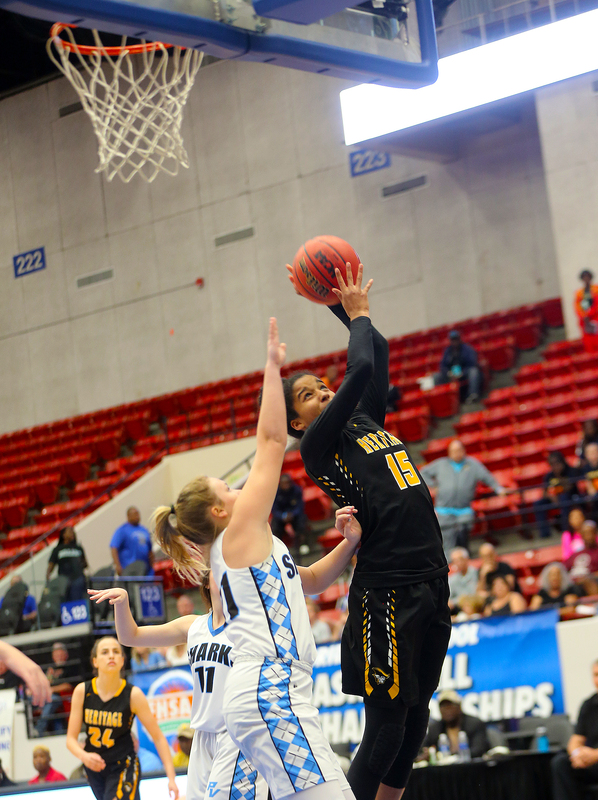 She grabbed a combined eight rebounds in the semifinals and championship. 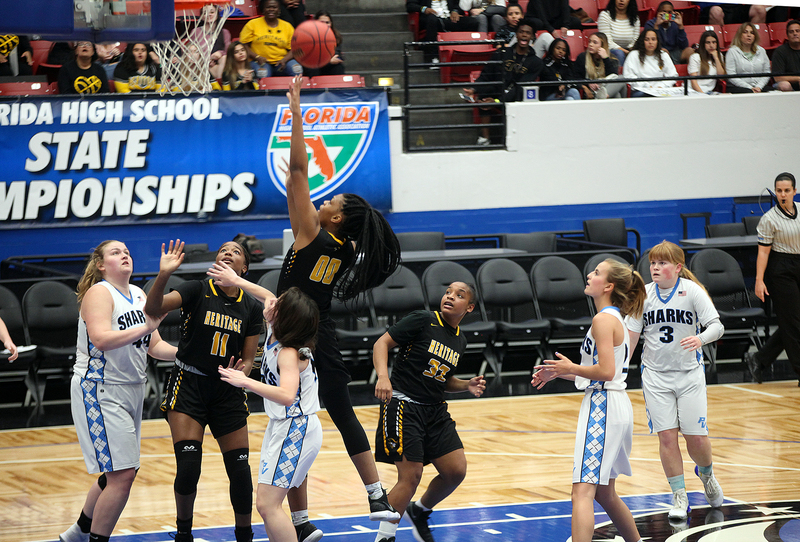 In the second quarter, December made another layup before Tiana got on the board with a 3-pointer that made it 27-14 with five minutes left in the second quarter. 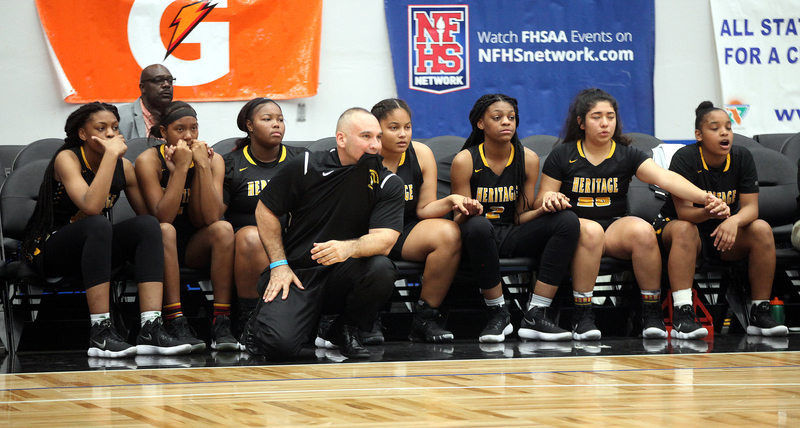 Heritage led 36-22 at the break and its comfort zone was never threatened in the second half. 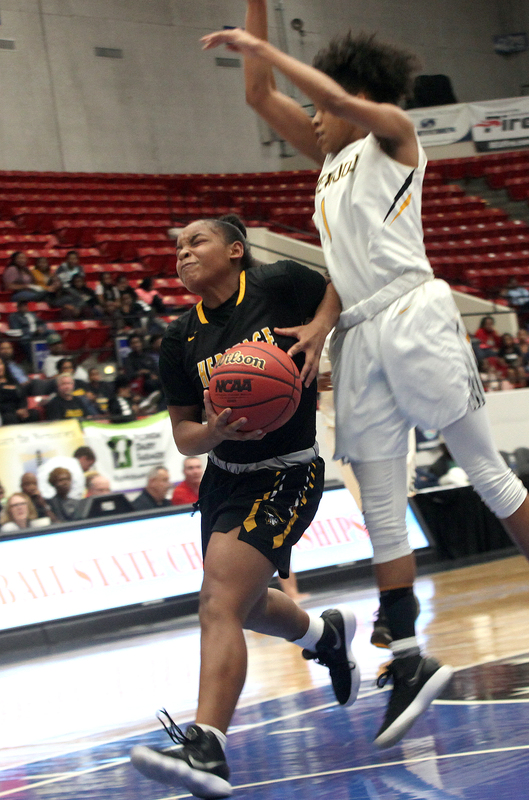 Femi Funeus led the Patriots with 19 points and Tyaliah Willis snagged 13 rebounds with 14 points. 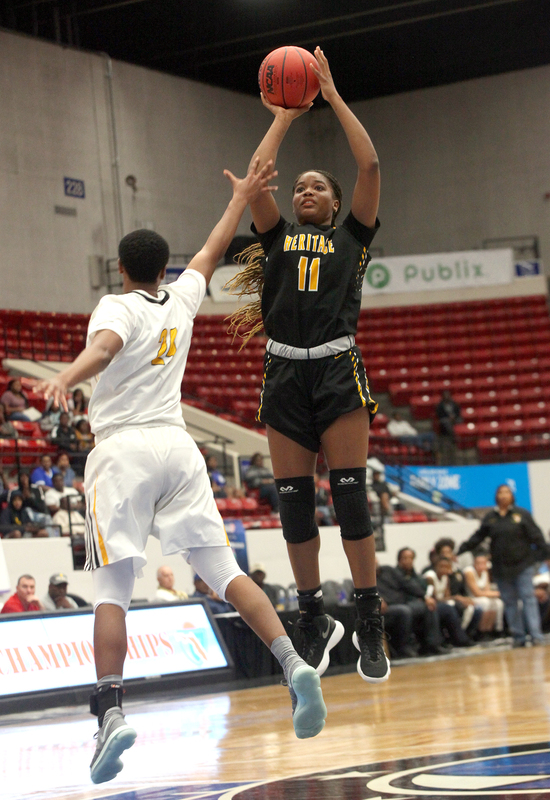 Tiana, a shooting guard, also had one rebound, one assist and one steal, but it was her success from beyond the arc that was most noticeable. 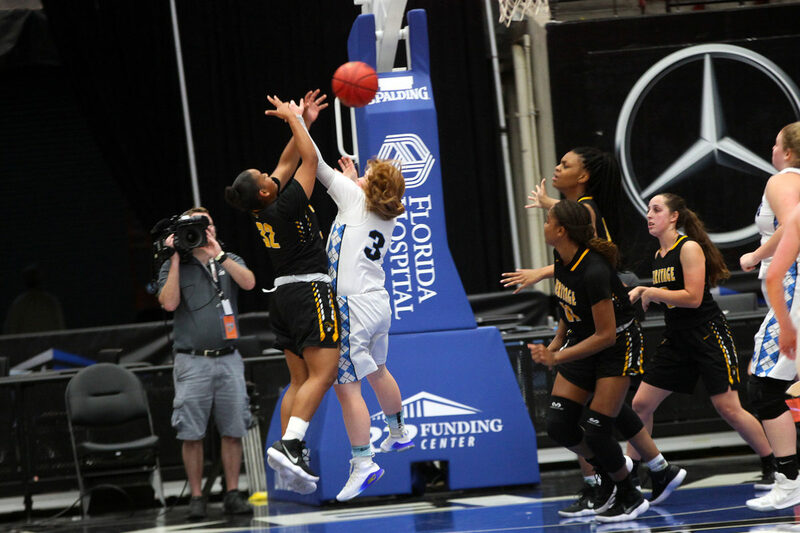 “When Tiana, who is one of the best 3-point shooters on the team, is on, it helps us all around,” Farias said. December’s contributions also included three rebounds and two steals. 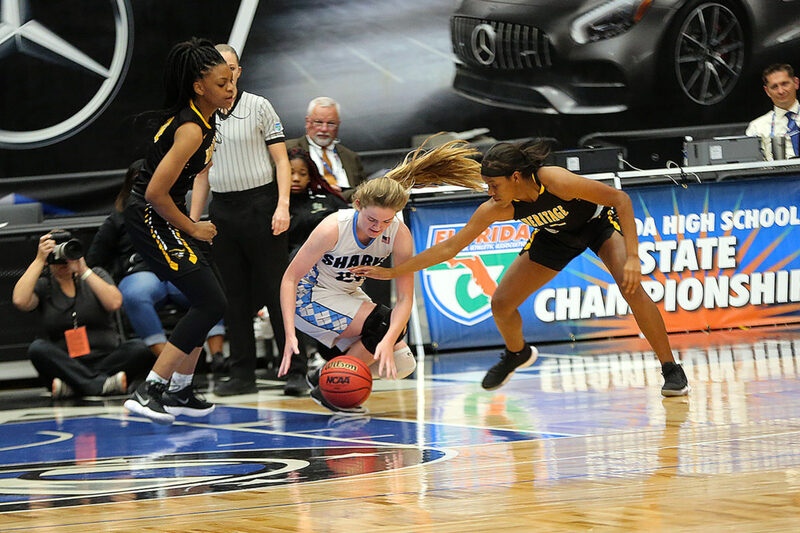 Defensively, the Stubbs played big roles in limiting Ponte Vedra’s shooting to 24 percent from the field. 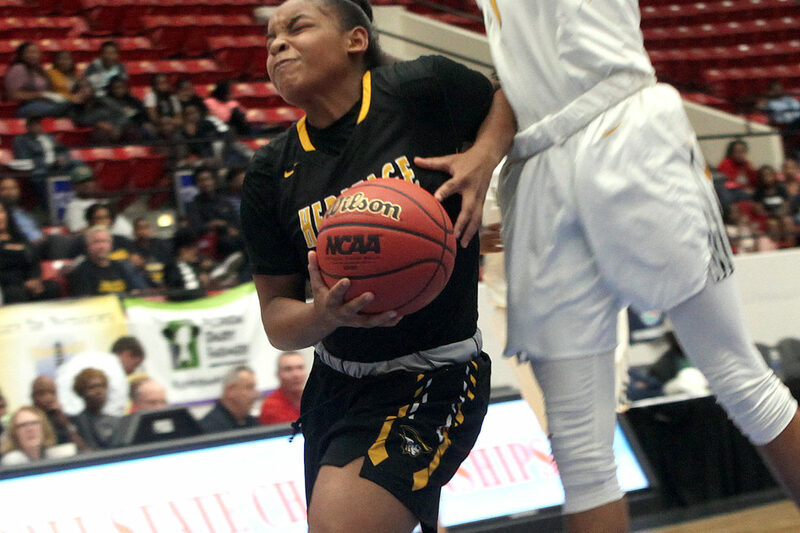 “They play really hard. 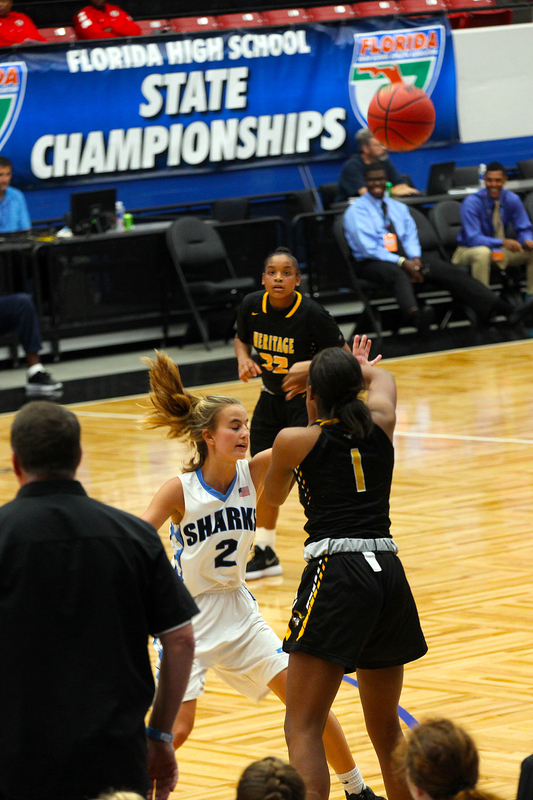 They’re pit bulls defensively, and that’s what we like. 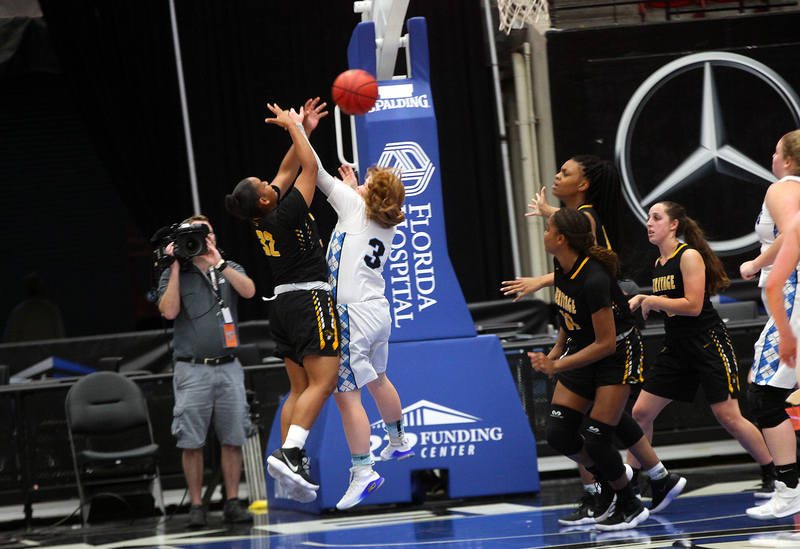 We had to go small because [Ponte Vedra] plays a lot of guards and I know December and Tiana play great defense and they hustle really hard,” Farias said. 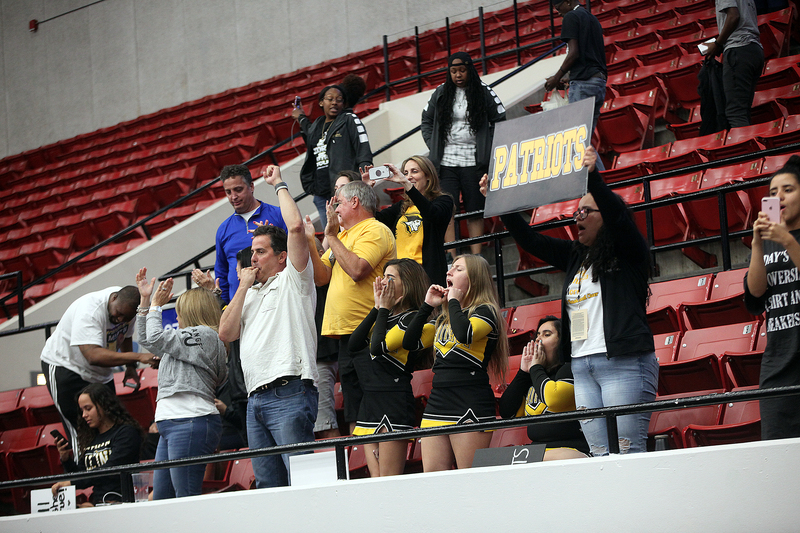 The Patriots will lose plenty of scoring and size to graduation, but most of the club, including the Stubbs, will be back. 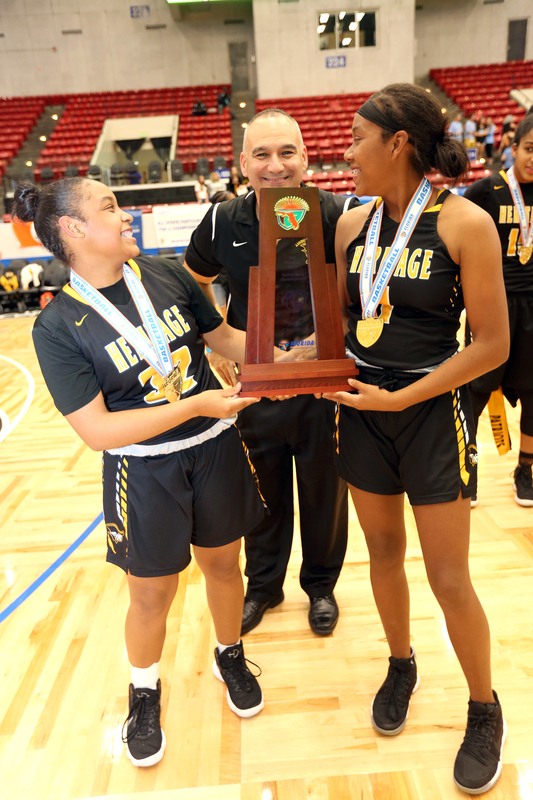 “It’s a bright future for those two young ladies next year for Heritage basketball,” Farias said.